The powerful DXTT3 3kW 'twin turbo' workshop heater features two high power 1.5kW ceramic heating elements. 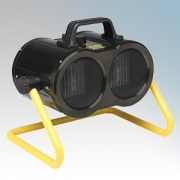 It is ideal for use in a workshop and features robust metal housing with dust filters. Dimplex Turbo Portable Workshop Fan Heater There is 1 product. 'Cookies' are small text files taht are stored by the browser (e.g. Internet Explorer or Chrome) on your computer or mobile phone / device. They allow websites to store things like user preferences. You can think of cookies as providing a 'memory' for the website. Find out how to control your cookies by clicking here. All contents © EDW UK Ltd 2008-2019 - Site design by Electrical Data Warehouse UK Ltd.